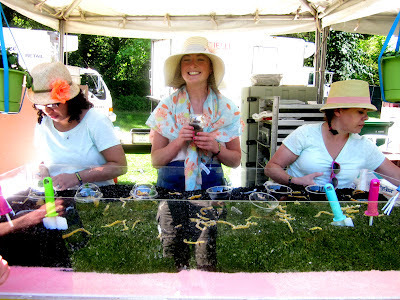 There's already been a crazy backlash from many people who went to Googa Mooga on Saturday 5/19/12 on their FB page and other forums, but our group kinda was expecting the long crazy lines and went to the festival as the gates opened to get our grub on. Things were pretty calm early on from around 11:30 to 2pm, and then the lines to get food went from at least one hour plus per stand (I read some stands took up to TWO hours!). But by that time thankfully we were mostly done and just sitting around on our blankets. Two weird things they did was put the beverage and beer lines together so people who wanted regular cold drinks had to wait in line with people who just wanted to grab a beer, making the lines insanely long. The other weird thing is that the beer and wine tent did not take cash. 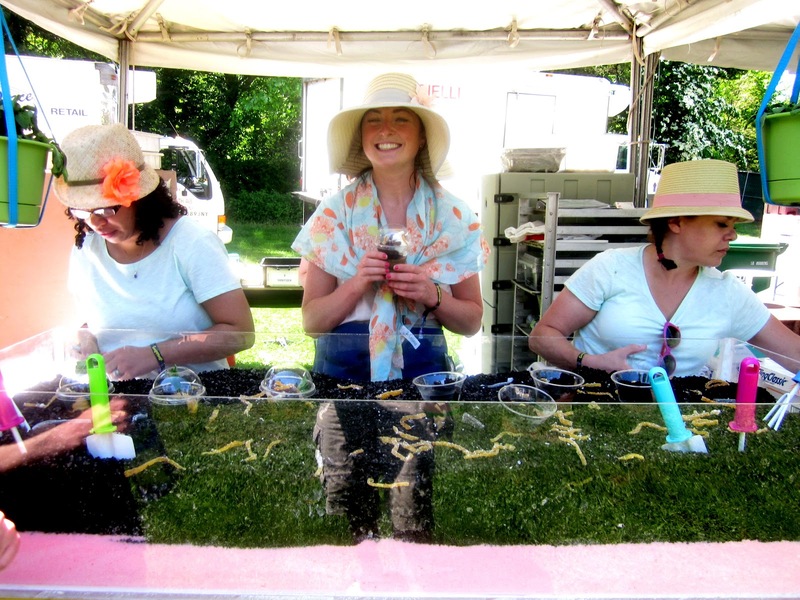 You had to fall in line to get "Googa Money" to exchange at the tents for cash to get to try the microbrews or the wineries. Some of the food we had was pretty good though. 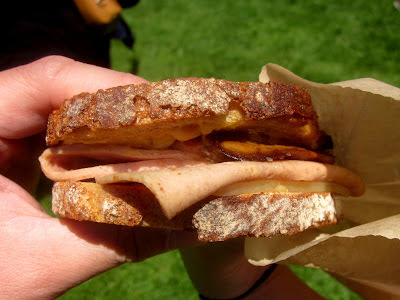 We started at the M. Wells stand for their horse bologna and foie gras grilled cheese sandwich. It was very pricey at $15 but still pretty tasty...at least they gave you a big piece of foie and the creaminess worked well with the grilled cheese. The slabs of pork bellies on the spits looked really good. 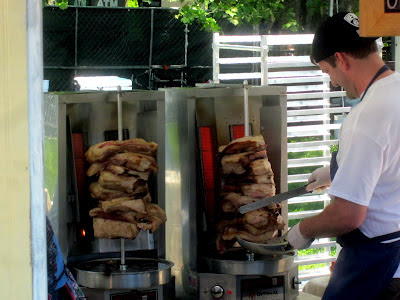 At $12 for two tacos one spit probably has about $1000 of pork belly right there!! 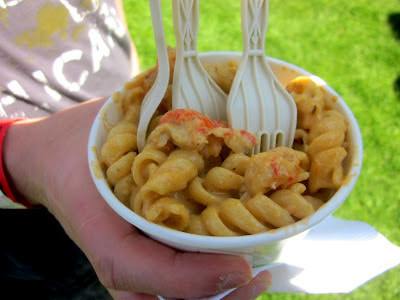 My brother took the plunge at the Crawfish Monica for their crawfish pasta. At $9, it was a complete rip off! You get a small bowl of pasta with a few pieces of crawfish. The taste was ok, but you're paying for crawfish, not lobster! 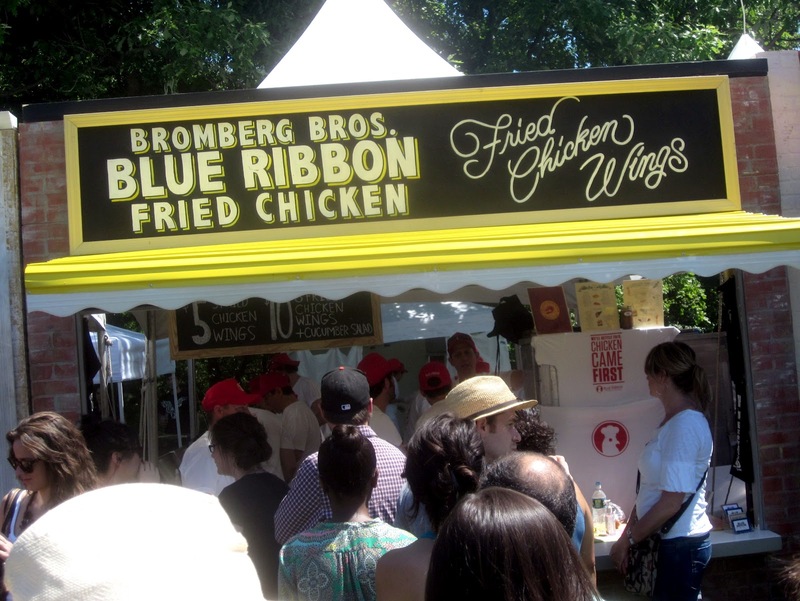 What was good was the Blue Ribbon Chicken Wings. I have no idea what they put on their wings, but it's a little spicy and maybe even has some Old Bay seasoning drizzled with honey. Six big wings and a cucumber salad for $10 was actually very reasonable price. This is part of a Blue Ribbon wing haha...so damn tasty that a bite was taken out of it before the pic was taken! One of the best things I had was definitely Katzie's Milk Chocolate Dirt Cake. My brother actually recognized her from Top Chef Desserts, and she recreated one of her items from her show. 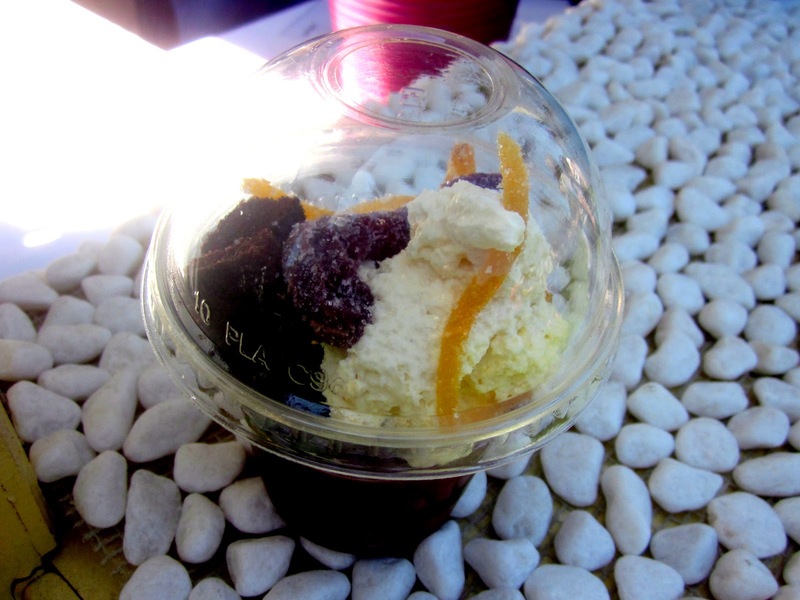 The dessert was awesome; it was a mix of chocolate pudding and chocolate devil's cake, orange cream, Werther's Worms (gummi worms), with orange cream. Such a unique mix of flavors and it all works really well! I was also looking to try Red Rooster Harlem since I've never been to Marcus Samuelsson's restaurant. They had a BerBere Roasted chicken with Mac and Cheese for $7. It was a pretty hearty and tasty dish. The chicken was very moist and had very interesting flavors. The mac and cheese was also rich and creamy. The cornbread served with it tasted a little weird though. 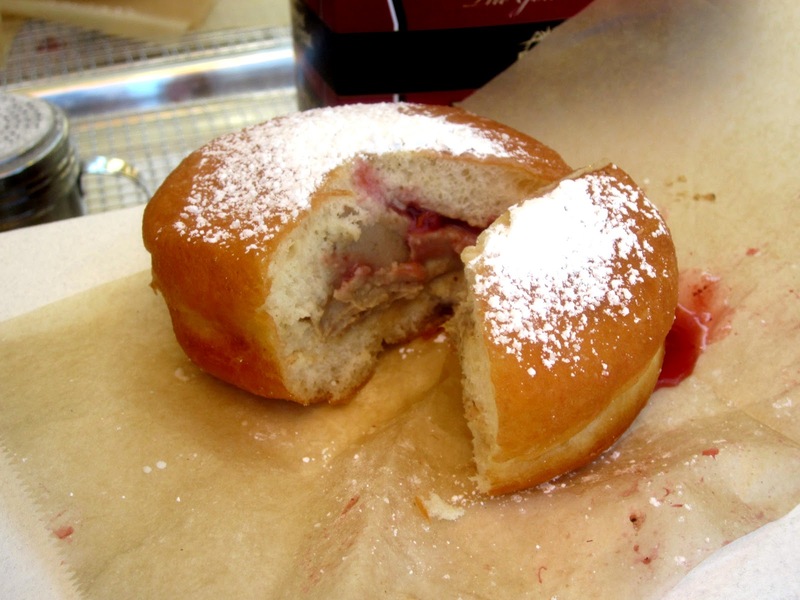 Do or Dine had a foie gras filled donut with some sort of jelly filling. This looked really interesting but the idea might have been better than the execution. The foie just tasted ok, and tasted like a savory cream filling with a little berry. 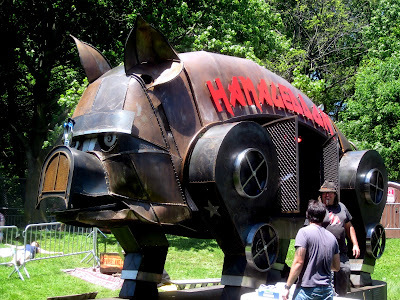 And finally, a picture of a pig roaster in the shape of a, well, giant pig! So all in all, it wasn't terrible as long as you went early. As the day went on the lines got insane and people barely moved. They have some things to fix if they want to do this again next year, but I actually had more fun eating at Smorgasbourg or last year's awesome Taste of Williamsburg.